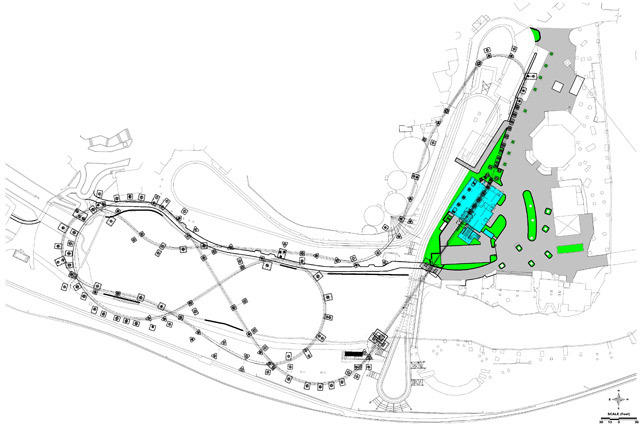 After months and months of a viral campaign, Hershey Park finally unveiled their plans for SKYRUSH in 2012. At 200 ft tall, 3,600 ft long, and 75 mph, the Intamin hyper coaster featuring first-of-its-kind Winged seats. Claiming the title as the park’s tallest, fastest, and longest coaster, SkyRush will feature 5 airtime hills, 4 highly banked turns, all surrounded by existing areas of the park. Interesting notes about the ride is that it appears to feature a Intimidator 305 style lift hill, and that the seating arrangements allow for only the outer 2 of the 4-abreast trains to be outside of the track. A bold color scheme was also chosen for the ride, with blue supports, and a yellow track, with matching trains. The ride is a welcomed addition to the park; the hyper coaster style will compliment the accelerator, beyond vertical drop, and other standard models well. However, I am a bit surprised the park decided to go with Intamin yet again, as now all of the park’s past 3 coasters have been sit-down Intamin models. The layout does appear to be fun, and while it may not change many people’s coaster counts it will surely be one of the top rides in the park. What I still do not understand is the viral marketing campaign. It just didn’t get us anywhere. For creating 5 fake companies, placing countless clues throughout the park, and running months of marketing campaigns, where did it get us? The layout was leaked from an outside source, the name was identified via trademark, and the height was found from permits. For an unthemed ride, the marketing hype seemed useless. But those are just my thoughts, what do you think of SKYRUSH? Leave a comment with your Park Thoughts below. Isn’t SkyRush the third Intiman (not fourth)? I agree… the marketing campaign seemed to be irrelevant. I’m glad I didn’t follow it though. I never said 4th, did I?